Vertical colored lines on broken screen — is it just my screen? I cracked my iPhone 5S screen on pavement. It's currently not covered under AppleCare. 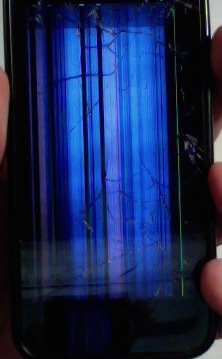 I'm wondering, though, if it's worth it to take this to one of those companies that replace broken screens. From what I know, they just replace the glass -- am I wrong in thinking that it's not just the glass that's broken here? The glass and screen are fused together at the factory. Replacement kits, such as those sold by iFixit, include the glass, LCD/digitizer (screen), and other parts. Cell phone repair stores/kiosks use this same type of thing when repairing devices. It's possible that additional parts inside the device were damaged, but it's also just as possible (and probably more likely) that the screen is simply too heavily damaged to display anything. Also of note - Apple will fix a broken screen for $129 out of warranty, so keep that in mind when comparing prices if you move forward with repairs. It is hard to replace only the glass on your phone. So the price is some high. Apple charges $129 (plus tax) to fix a broken iPhone 5s screen. If you can't get to an Apple store, you can mail your device in to Apple for a shipping fee of $6.95. If you purchased AppleCare+ ($99 for two years) for your device, you'll only have to pay $79 for a screen repair -- though AppleCare+ only covers two incidents of accidental damage. My advice is that you can buy the screen replacement with the lcd digitizer and other small parts from a reliable supplier like hcqs.cc then you can do the repair easily. If you've powered off/on the iPhone and do not see any semblance of the iOS and or Home screen then I'd say it was more then just the glass that's broken. Not the answer you're looking for? Browse other questions tagged iphone screen . Is there a replacement glass panel for iPad that is “matte”? iPhone 5s screen separation; what will happen when I take the device to an Apple Store genius?